Marketers used to target different types of videos to promote their brand across the web. The way of conveying the brand message plays a vital role to reach the things differently. 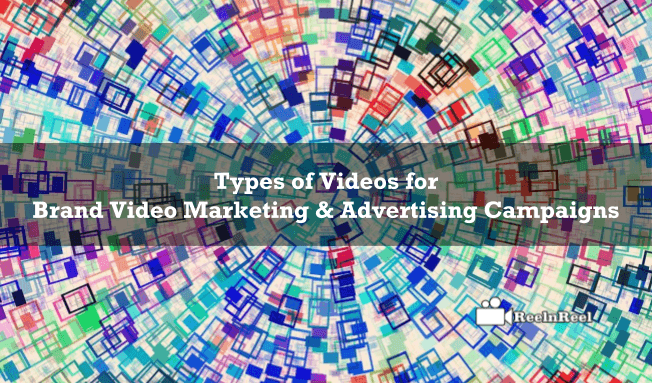 So marketers have to know about different video types to reach the targeted audience. Let us know about some different video types that can be helpful for your brand marketing and advertising with video content. Branded films are not totally a commercial one or a demo about the brand. It is beyond that. The branded films are always impersonating which captures the moments and make the audience spell bound with an impressive presentation. The storytelling is mixed up with the vision and ideas which can grab the viewer’s attention. Many brands are already got successful using the brand films in their strategy. For example, Honda’s Ignition Ad makes an unforgettable impression on the viewers with its brand film. The ad targeted a humanoid robot ASIMO along with various Honda products throughout the film. It was targeted to mark the brand in audience mind and finally got successful. Educational videos can add real value to the content marketing where you can answer the general queries of the users about your brand. So make it clear and informative to the audience to get good engagement. These types of video content are simple and best way to convey the things about your brand. The video must be delivered in an entertaining way. More than 75 percent people like to watch how to type of video content before buying a product. The video documentaries can reach your audience about new information related to your products and brand. All you have to do is to make it more comprehensive to your audience and it must convey with a good storytelling. The documentaries type of video content can increase the brand value as well as target the viewer at the center. It can also connect the users emotionally. The emotional and entertaining content always target the story within rather than the story of the brand or product or services you offer. For example, you might have seen several ads which made us think about the story it was visualized in the ad rather than what that particular brand is offering. Yes, exactly, the entertaining and emotional videos must be created in this way to raise the motion of the people towards the brand. It can strengthen the connection between brand and consumers. Explainers are the best way to convey about your product or services in a detailed way to the audience. Generally, explainers are from 30 seconds to 2 minutes in length. The majority of explainers in animated type are getting good engagement comparing to another form. These videos are simple and can deliver the better brand message to the audience across the web. Traditional email marketing was turned modern with video in emails. Yes, you may already know how powerful the video is in marketing. So, include the video content in your email campaign. A good video thumbnail with play button can make your leads through your video email campaigns. According to survey reports, it was revealed that email with a video has higher click-through rates than normal emails. So, achieve the things in a smart way by including the video in emails. Product videos can provide your audience a better understand about your services or product you are offering. It also helps you to give deliver your message to the audience. The main thing is to visualize your product in an attractive and interesting way to your audience. Customer buying behavior was changed, and they are more likely to buy a product after research and knowing others opinion ad experience of using your product. So, testimonial videos can enhance the leads. This type of video must create a genuine opinion on your brand or product. It helps you to reach the potential customers towards your brand. The product advantage must be naturally delivered to the audience to build trust and loyalty with your audience. About us, web page and About us videos can do many things for your product promotion. These type of videos must have some humor and personalized values of your brand or business. The video must cover the products and services you offer to the audience. The video must provide the audience a simple overall view about what exactly you are doing and what you are providing to your audience. The FAQ’s can help you to get connected with your audience because once you have released the explainers, testimonial and about us video content to your audience, they may have some questions in their mind about your brand. So target the generalized questions and answer them by making an FAQ video content to your audience. Try to provide them a solution to their questions and make them clear in their mind. This can helps you to build a better community for your business. These type of videos must be a personal response to your audience questions. These types of videos can deliver the sense of security and comfort to your customers. Your audience may think that the connection between you can be broken once the product was purchased, so, it is essential to make your customer feel that they are still secured and can trust you. It can build you potential audience towards your products or services. The demonstration type of videos is also helpful in customer support and webinars. These videos must contain how to use the product once it was received by the customer. These types of videos can build trust with your audience towards your products and services. Personalized videos can help you to get good leads and develop better relation and connection between the leads and brand. A highly personalized video can bring your audience to the purchase page and can increase your sales leads. Your conversions rates will get increased with personalized video content. Thank your customers and build your loyalty to your customers too. Thank them for connecting with your brand or products. Make them feel loved and cared. Finally, every video content type has its own agenda that can deliver to your targeted audience. Hope this is helpful to you to fetch new ideas and for choosing the right video type for your brand.